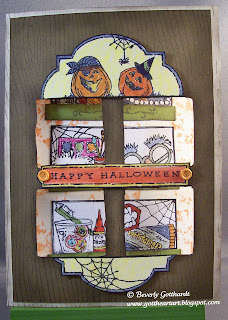 Continuing the Halloween theme today, I've made this Wonderful Window card. It's not a 10 minute card, but it's not that hard to make either. 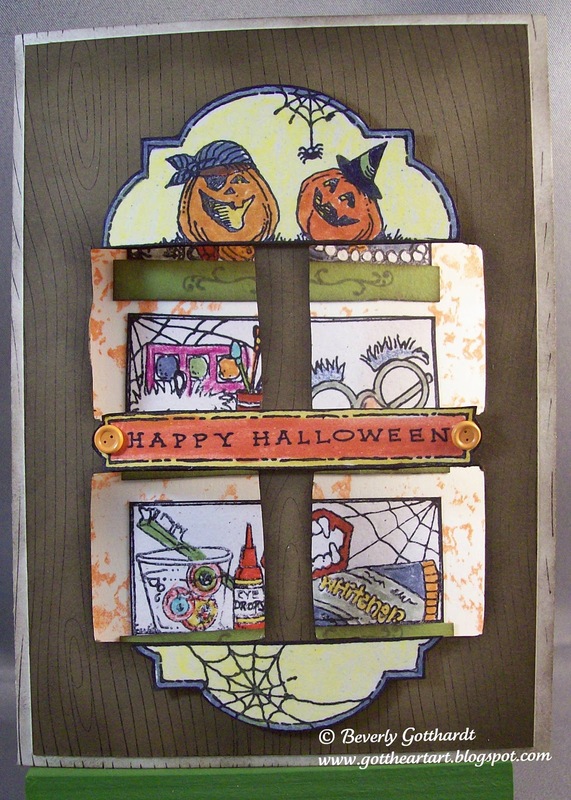 Once you get the 4 windows cut through the card stock and the card it's a snap to stamp, color, and decorate. 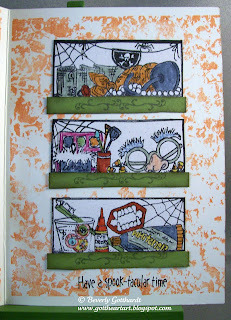 Supplies: Ivory Card Blank 4" X 5 1/2" Halcraft, Papers: SU-Naturals Card Stock-White and Ivory, Soft Suede, Old Olive, Stamps: SU-Woodgrain, Rogue Redhead Designs-Beach Babes background stamp, Stampendous-Pumpkin Plaque, Art Gone Wild-Cluttered Cabinets-Halloween, Clear Art Stamps-Halloween Fun, Ink: SU-Wisteria Wonder, Early Expresso, Tangerine Tango, Ranger Archival Ink-Jet Black, SU markers-Pear Pizzazz, Sahara Sand, Calypso Coral, Ruby Red, Poppy Parade, Wisteria Wonder, Dusty Durango, Daffodil Delight, Pool Party, Tangerine Tango, Concord Crush, Lucky Limeade, Peach Parfait, Sakura Gelly Roll Pen-white, Fiskars -Windows 1 shape cutter template, The Paper Studio Spare Parts-orange button brads, SU-dimensionals. What a cute card, Beverly! The images are so cute and I love the way you made the window! 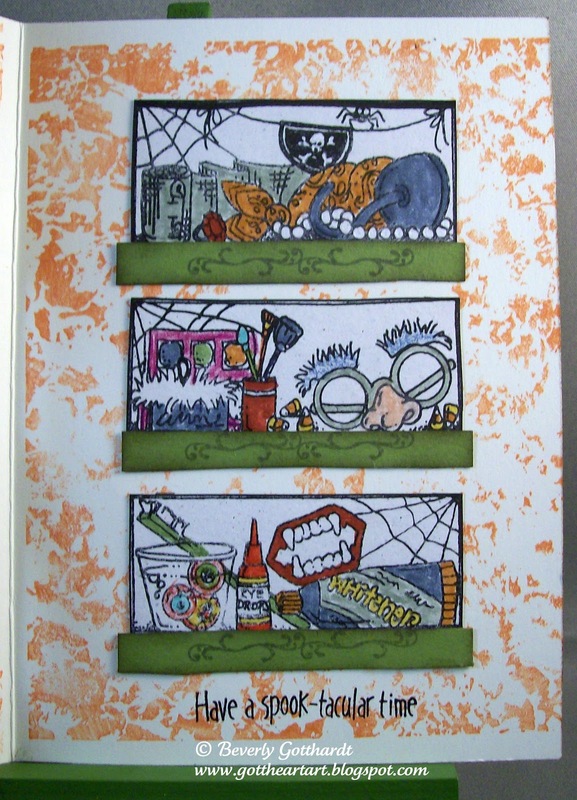 Great Halloween art and terrific job on the window challenge. Hope you are doing well. Sorry it's been so long since I visited you! Always great to have you playing along with us at Our Creative Corner!